Analyzing a city’s health is easy for travellers – for those who don’t know how a city ticks, its easy to find the assets, as well as its flaws. Thanks to experience and helpful hints from friends, I’ve learned to look for what makes a place distinct. As I don’t drive, the ease of getting around is always key for me – how is it for a pedestrian or cyclist? Its one’s of the signs for me about a city’s life – if its only rooted in cars, its not going to be a city that ultimately will make it easy for those who visit. In the small Baja town of La Paz, the first thing I noticed was the malecon, a five kilometre walkway that spans the town’s water’s edge. For the locals, its all about this pathway, which welcomes walkers, runners, skateboarders, rollerbladers as well as many canines to wander through the town. There’s the marina, beaches and fishermen’s boats along the one side of the malecon and a bike path along the other side. And on the opposite side of the street, restaurants, cafes, hotels, boutiques and souvenir shops are lures for those visitors who wander during the day, while the ice cream shop and taco bars lure locals at night. 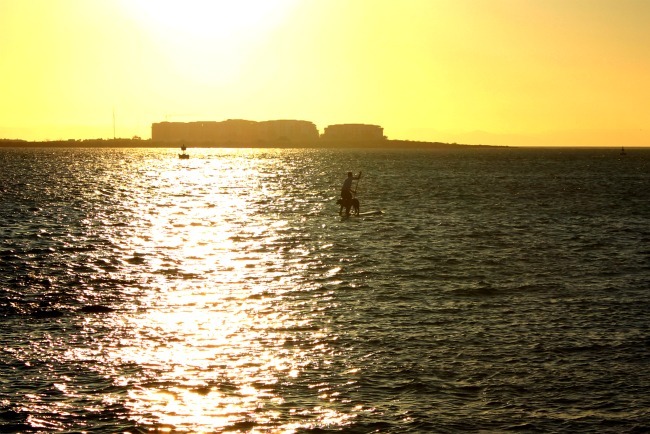 As I walked the malecon close to sunset, I noticed a stand up paddler with his dog, paddling along parallel to the malecon. I could see many people on the malecon gazing out at him, as he came closer to shore, with his dog alternating between swimming and standing on the board. I walked along, seeing the various sculptures, seeing families and young friends, couples and travellers,I knew this place was not only safe, but was a welcome place for anyone. I know its a small town, and not a big city, but a place that realized that welcoming all forms of transport would make the city better – whether its arriving by bicycle or motorcycle. Young or old, the downtown of La Paz was a welcome spot to spend time, no matter what mode of transport you chose to get there.